Switchfoot is a Grammy-nominated alternative rock band from San Diego, California, United States. 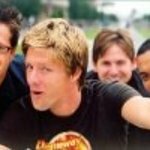 The band’s members are Jon Foreman (vocals, guitar), Tim Foreman (bass, backing vocals), Chad Butler (drums), Jerome Fontamillas (guitar, keyboard, backing vocals), and Drew Shirley (guitar). 3 Doors Down Adam Gregory Adriana Lima Alec Baldwin Amber Heard Andy Cohen Angela Bassett Angie Harmon Ariel Winter Arnold Schwarzenegger Ashley Greene Ashley Tisdale Graham Nash Joel Madden O.A.R. We don't have any videos related to Switchfoot.